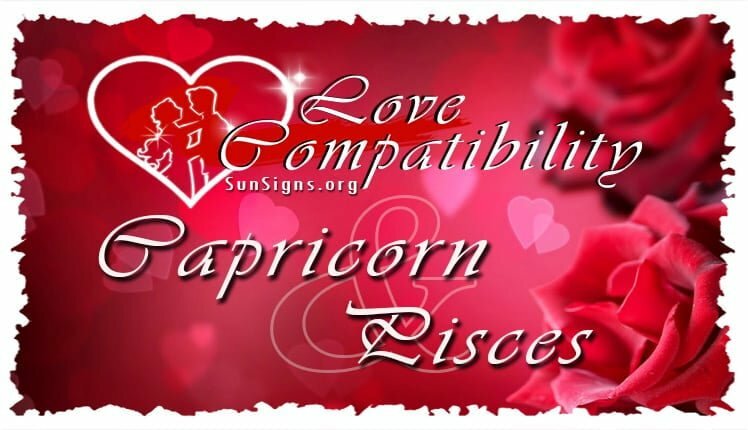 A Capricorn and Pisces in love are another one of those matches made in heaven! But like anything, only if it’s managed correctly! Capricorn is one of the zodiac signs that works his or her way to the top. This is appealing to the security seeking Pisces, who likes to have someone to look up to and cling to. Therein lies the rub, to quote Shakespeare. The way the Capricorn personality acquires that stability is through long hours and hard work. They thrive on it. However much Pisces loves the fruits of his or her love’s work, he or she also needs to attention from our hardworking goat. If not managed well, this could lead to trouble in paradise for or respective goat and fish! Capricorn, if Pisces loves you, he or she will make your world as smooth and comfortable as possible. And you won’t have to say a thing or lift a finger; they do so by intuitively watching for what you need. You won’t need to ask for dinner or to have your shirt pressed. Your Pisces lover will already know you’re hungry and your shirt will be hanging in the closet. This is great news for this Capricorn Pisces compatibility as the goat would just as soon spend his or her efforts in the office, than taking care of his or her own needs. And Capricorn star sign will indeed spend time in the offices, because there’s one thing they love to do more than anything else, and that is work. They are made to work, and they thrive off of it! Your Capricorn lover not only wants to work hard, but he or she is willing to work his or her way to the top. They desire to be the king or queen of your kingdom and have no problem climbing that ladder. And if you’re lucky, Pisces, they’ll have a throne ready for you, too. This is good news for our security seeking fish! Because, unlike their cousins the fire signs, earthy Capricorn does not claw their way to the top because they want fame and a spotlight, they want emotional and financial security. In fact, their emotional security comes from financial security. The more the Capricorn man or Capricorn woman has in the bank, the more calm and secure they feel. They don’t like their security to be challenged or for the status quo to be disrupted. These Cardinal signs are not open to changes in life. And the Pisces man or Pisces woman can abide by this, because this stability creates a stress free, happy home for them to cultivate into a warm, inviting environment for their Capricorn lover. And if the Capricorn Pisces in love are evolved souls, there will me no squabbling over gender roles in this relationship. These two zodiac signs are far too pragmatic. Regardless of whether the Capricorn lover or your Pisces lover is a male or female, they will gravitate to roles that they’re suited best for, rather than what gender dictates. Speaking of a breaking gender roles, the fish is almost always the nurturer and the goat, the powerhouse when the Capricorn Pisces are in the bedroom! Now don’t discount Capricorn’s quiet predictable soul, because if you think he or she is a powerhouse at work, they’re twice that for their trusted lover. They’re especially giving to someone who they feel appreciates them, and doesn’t take advantage. So, Pisces if you want someone to create stability, and be a hard-working rock that you can look up to, choose a Capricorn lover. And Capricorn, if you want a lover who intuitively makes your life comfortable and manageable, which includes finding your “sweet spot” in every aspect of life, choose a Pisces lover! There are a few areas where this “made in heaven” Capricorn Pisces compatibility can get tripped up. The first stems from the fact that Capricorn is a very judgmental sign and Pisces is so afraid of rejection, that he or she might trip up Capricorn’s “Judgment meter”. Here’s an example: A Pisces fancies a Capricorn, so much so that he or she is bursting with affection on the inside. He or she will think of stratagems to contact the Capricorn without potentially getting hurt or rejected, like sending anonymous texts or leaving an unmarked flower their intended’s desk. Here’s the problem, the Pisces personality is so worried about getting hurt, that the signs aren’t obvious enough, and the attempt ends up being a near miss, instead of a loving Capricorn Pisces relationship. The other side of this is that these stratagems will come off seeming creepy and stalker-ish to our very judgmental goat. This will end a potentially fabulous Capricorn Pisces friendship before it even begins! Speaking of judgment, Capricorn is full of it. And especially if they have some fire in their chart, they won’t be shy about sharing. This isn’t good for our sensitive fish, the Pisces, who tends to retreat when criticized or, as I mentioned above, will resort to passive aggressive stratagems. Likewise, Pisces has a long emotional fuse and you have to cross their invisible boundaries many, many times before they explode. But when they explode, this explosion seems to come out of the blue for their unsuspecting partner when the Capricorn is dating the Pisces. Why? Because Pisces doesn’t like to set emotional boundaries and he or she does not like to say “no”…even when they should! This mutable sign hates confrontation, even if it might benefit them in the long run. So, a particular incident that you have been doing for years may be the last straw for your Pisces partner, but you’ll never know it until it’s too late! Another aspect of not managing their emotions in a Capricorn Pisces marriage might be their response to their own hardships—they’re very easy to blame others for what might be their own doing. Pointing the finger of blame becomes a big problem if you point your finger at the walking judge and jury, i.e. the Capricorn. This may not ever manifest itself as an outward battle, but it does manifest itself in a rage inside you. This makes life very unpleasant and sooner or later, one or both of you will sneak out the back door for good! This may cause our judging goat, the Capricorn, to lose interest in our sensitive little fish leading to a Capricorn Pisces breakup. Because Capricorn likes a partner who works with them, but they need to maintain individuality and stand on their own. A minor issue, which could become major if it’s not addressed, is Capricorn’s work. Pisces, decide which you want—the monetary spoils of the goat’s work or time, because he or she can’t do both in this Capricorn Pisces love compatibility. If you love the results of Capricorn’s workaholic nature, then don’t complain that they’re never home. So Capricorn, be careful not to judge your Pisces too harshly, remember all of the things he or she does for you first! And Pisces take responsibility for your own emotions and actions, before exacting your passive aggressive wrath. And, for goodness sake Pisces, be a little more direct when starting up this Capricorn Pisces relationship. Nothing will end this relationship faster than if Capricorn thinks you’re a stalker. Capricorn and Pisces in love fit together like pieces of a puzzle, a perfect complement to each other. Capricorn, give your little fish a chance step out into the light without fear of judgment. And Pisces let your goat be the workaholic he or she is. If you want their time, make that clear, but you need to understand that this will cut into the earnings. Follow these rules, and you two will remain a perfect fit!